When teaching and practicing routines, students benefit from specific examples and visuals. 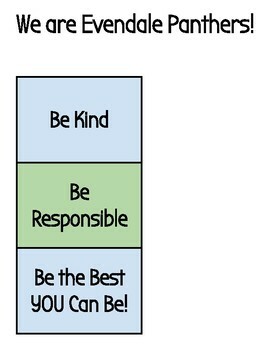 Our school rules are: Be Kind. Be Responsible. Be the Best You Can Be! The explicit examples for students in this matrix reflect those three statements but can be edited to fit your own school or classroom rules. The times of day that are included are in the morning, during whole group, during Daily 5 or Daily 3, in the cafeteria, at recess, during small groups, during transitions and during dismissal. 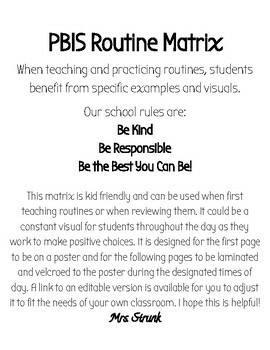 This matrix is kid friendly and geared toward students in the primary grades. 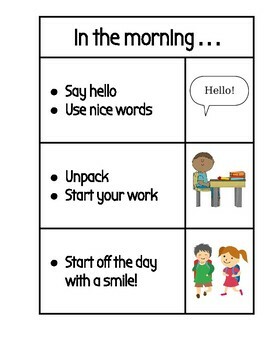 It can be used when first teaching routines or when reviewing them. It could be a constant visual for students throughout the day as they work to make positive choices. It is designed for the first page to be on a poster or whiteboard and for the following pages to be laminated and velcroed to the poster during the designated times of day. 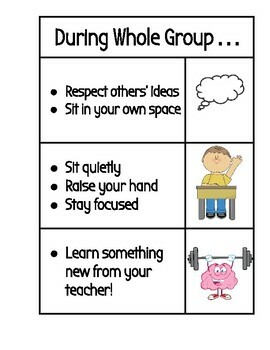 This allows students to see that the rules stay the same but there are different ways of honoring them during different settings. A link to an editable version is available for you to adjust it to fit the needs of your own classroom. All Clip Art was found from Google Images. I hope this is helpful! Please contact me if you have any questions after downloading.